Mozart, Strauss, Beethoven and Tchaikovsky. All icons who are amongst the most celebrated of all classical musicians. Their music is played all over the world but the lives of these incredible individuals are often shrouded in mystery. Discover the great stories behind masterpieces including Beethoven's Moonlight Sonata and Tchaikovsky's Swan Lake. Understand what their real life challenges were. Discover how Mozart came to play his first public concert at only six years of age. 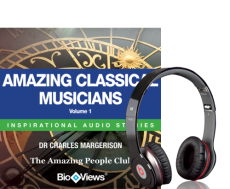 These unique BioView stories will bring new perspective to your understanding of these amazing classical musicians and the amazing music they created. BioViews® which are short biographical stories, similar to interviews. These unique stories provide an easy way of learning about amazing people who made major contributions and changed our world.